House Republicans voted overwhelmingly for a measure opposing a carbon tax, attempting to thrust the issue of climate change into the midterms. WASHINGTON — House Republicans voted overwhelmingly Thursday for a measure putting them on record against the idea of a carbon tax, attempting to thrust the issue of climate change into midterm politics by putting Democrats in a position of supporting a new tax that could also increase the cost of energy. But the vote also put some GOP House members in a tough spot in their re-election races and could concern the Republican caucus as a whole as it works to maintain control of the House in November’s midterms. The measure passed 229-180, with six Republicans voting against it, one voting "present" and seven Democrats supporting it. One of those Republicans voting no was Rep. Carlos Curbelo, who is among the most vulnerable members of the House this fall. Curbelo, who represents South Florida, including the Florida Keys, in a district Hillary Clinton won in 2016 and one that is greatly affected by climate change, is co-chair of the bipartisan climate change caucus. "It was a defensive move," Curbello said of his vote. "It’s kind of odd. Just imagine if we just voted all the time on what we would oppose. I think it would be not a good use of floor time." 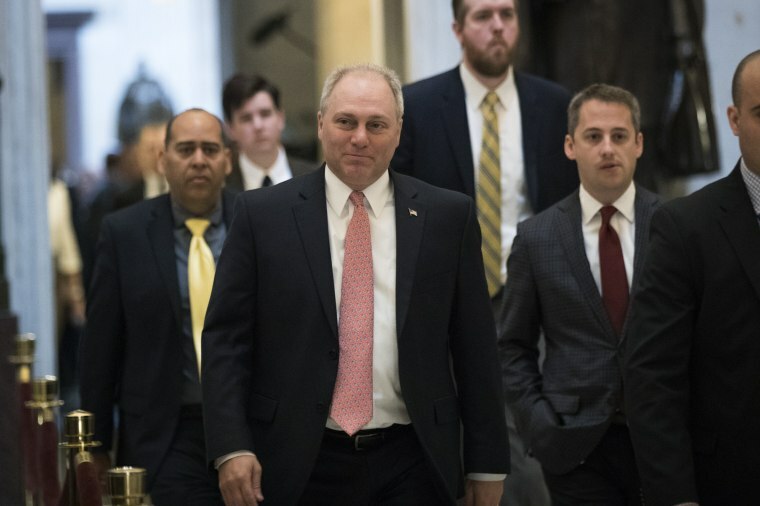 The proposal was offered by Rep. Steve Scalise, R-La., whose district is filled with oil drilling and who also is seen as having aspirations to be speaker when Rep. Paul Ryan, R-Wis., leaves Congress at the end of this term. The measure has been voted on in previous years and was supported by Curbelo in the past. “The carbon tax is all about taxation and money, it is not about the environment and I think the American people are seeing when you reduce government taxation, it is better for everybody — and they are living that right now,” Rep. Barry Loudermilk, R-Ga., said. To counter the anti-carbon tax resolution, Curbelo is introducing legislation next week to address climate change. It would institute a carbon tax, re-distribute the gasoline tax and authorize $700 billion of infrastructure spending, all of which puts him at odds with most in his party. While Curbelo's bill is unlikely to be brought up in a Republican-led Congress this year, he said it will be useful in the near future. "There will be either a political alignment or some kind of crisis that requires or that facilitates the consideration of this kind of concept," he said. The issue of climate change is not a winning one among the GOP base. Of the 78 percent of Americans who think climate change is real, according to a CBS News poll in April, 54 percent think that it is caused by human activity. But Americans are divided by political affiliation. Only 29 percent of Republicans say it is caused by people, while 75 percent of Democrats do. Fifty-four percent of independents blame humans. But the messaging amendment, which has no teeth, is difficult for a number of GOP members who would prefer not to be on the record on climate change. One Republican member of Congress, who was granted anonymity to speak more freely and who is a member of the climate change caucus, said the more difficult issue concerning the vote is it puts members in a rhetorical box. Another worry is that in particularly difficult races, Democrats can now label their Republican opponents as climate deniers.